He’s done it again! 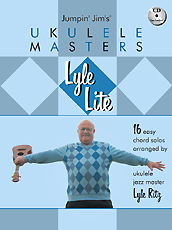 Lyle Lite is the third songbook/CD arranged by ukulele legend, Lyle Ritz. This time Lyle has arranged 16 easy chord solos (GCEA-tuning) with advanced beginners and intermediate players in mind. Lyle also plays uke and bass on all of the songs on the accompanying CD. Arrangements include “Avalon,” “Bye Bye Blackbird,” “Edelweiss,” “Let Me Call You Sweetheart,” “On The Beach At Waikiki,” “Ramblin’ Rose,” “Surfer Girl” and nine others. For fans of ukulele chord solos and Lyle’s arrangements, this book/CD is a must. A perfect next step for beginning players looking to stretch their skills. (Go to the Jukebox on this site to hear two tracks from the CD).